An evening of airwork (holds, DME arcs, etc. ), the VOR-A approach (with circling) into Rio Vista (O88), and the VOR/DME RWY 27L approach back into Oakland, almost all partial-panel. Not the best of lessons. Or rather, a good lesson in learning what not to do and identifying what I'm doing poorly; but I do so much poorly this evening that I end up feeling a little depressed. I seem to have lost last week's gains. Once again, I'm behind the plane more than I'd like to be, and I make several stupid blunders that I just shouldn't be making at this stage. The main point of the lesson turns into -- as John puts it -- trying to learn to have grace under pressure. Too many times this evening on the approaches, or during airwork, or when the radio's getting on top of me I have these little moments of panic or momentary confusion when I suddenly realise (or just think) that something's wrong, and instead of just sitting back for a moment and thinking calmly through the situation to what's important, I obsess too much on one thing and lose the big picture. It's a dumb thing to do -- after all, in the big picture I'm still flying mostly straight and level, and I'm not close enough to anything to cause problems -- but it seems to be today's little gremlin. John later points me at Rod Machado's column in this month's AOPA Pilot which discusses those inner demons that you have to learn to filter out and not flood your mind. I read it the next day (I'm an AOPA member), and it's a typical Machado thing -- well written, funny in a slightly corny sort of way, and quite helpful. It meshes well with what John's saying. I need to exorcise my inner demons, or at least learn to filter them out more effectively, when it comes to those things that distract you from getting it mostly right. It's also about turning the scary uh-oh moments into more muted aha! moments, I guess. Or D'Oh! moments, at least. Even earlier, while I'm waiting for 4AC to come back on line after an oil change, I hear the familiar sound of radials (the engines) and look up to watch a large two-engine amphibian taking off on 27R and lumbering slowly into the air. After a couple of minutes it still seems to be just over the airport boundary to the west, doing what looks to be about 50 knots gropundspeed, if that. The noise is beautiful; the plane itself looks great, graceful and very retro-before-its-time. John thinks it's a Grumman Widgeon, but I suspect it's a Mallard -- the Widgeon looks too small and (according to my Field Guide to Airplanes) didn't have radials, just inlines or turbines. There aren't that many Mallards left in the US, apparently; but it's the sort of thing you occasionally see at Oakland among the assorted P-51's, DC3's, T-28's, etc. 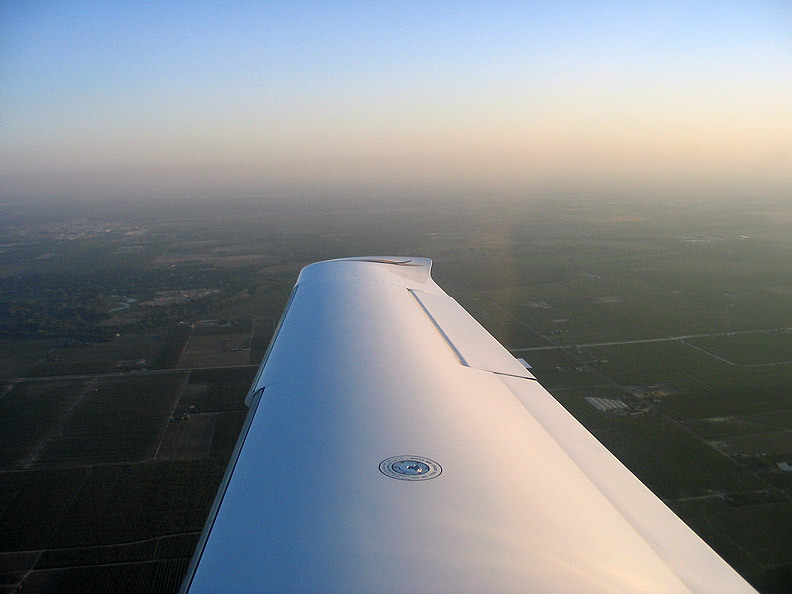 The FAA specifies that the round-trip distance has to be more than 250 nm and has to include at least three different types of instrument approaches with reference to instruments only (i.e. no visual or contact approaches). We want to stay on the L-2 enroute chart and not have to drag along (or buy) a whole new set of charts for (say) Southern California, Southern Oregon, or Nevada. We want to maximise the amount of actual -- California's coastal summers give you a lot of chances for actual without thunderstorms or icing, so it's good practice. And I really enjoy the transition into and back out of actual. I want realistic traffic and routing conditions, to see what really happens once you're in the system (who do you call for a clearance at a place in the middle of nowhere? 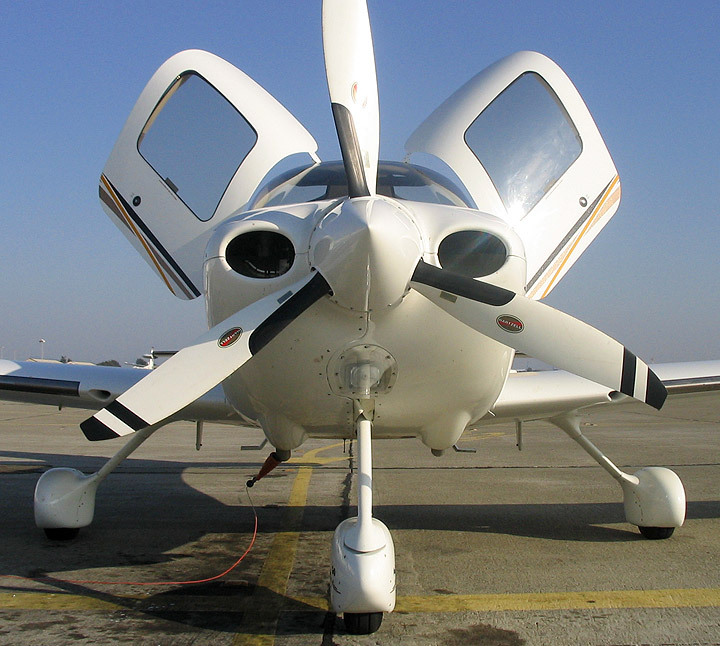 Will center vector you early for an approach instead of making you fly the full procedure? How do you cope with real pattern traffic at untowered airports out in the sticks? Etc..). For the 250nm / three approaches bit, there's a huge choice of routes and airports here in Northern California, so there's also no problems with the second requirement. We don't have an IFR-capable GPS in the plane we'll be using (4AC), so I want something like an ILS, a VOR approach, and maybe either a localiser or LDA approach. I don't particularly want an NDB approach. And almost any decently-long trip here will satisfy the last requirement as long as we include an untowered airport somewhere away from the larger population centers. So I make two plans, based on the forecast ceiling at Arcata an hour before we depart (Ukiah will always be clear at this time of the year, so that isn't a factor). Firstly, if the forecast ceiling for our arrival time at Arcata is at least 500' higher than ILS minimums, and not forecast to get worse, we'll go straight for Arcata, refuel and eat there, then come back via Ukiah. Otherwise, if the weather looks really bad, we'll fly to Ukiah first, refuel, then head to Arcata; if we land there OK, we'll have lunch, refuel, then head back to Oaktown; otherwise, we'll go missed, head for Ukiah for fuel again (and do a different approach), and try to scrounge something to eat there (there's no on-airport cafe as there is at Arcata), then head back to Oakland. We'll amend the decision (and flight plan) in the air if Flight Watch give us a different forecast for Arcata as we get near Ukiah. The route planning isn't hard, but I can't quite believe they'll give us the route we ask for, so I do two versions of them as well. The first looks like KOAK V107 PYE V27 FOT KACV / KACV HOCUT2.FOT V27 ENI KUKI / KUKI ENI V27 PYE V107 KOAK. These three routes are what we'll actually file (or obvious variants depending on whether we go up via Ukiah or direct), but as well as these routes I've programmed into my handheld GPS some variants that seem more likely to me based on my very limited experience. I'm prepared to jettison any of these routes as we go along -- my guess is that Center will vector us along short cuts to the approaches and possibly even enroute -- but they're fairly simple routes in any case. We shall see. And yes, I could have done the whole Chico / Ukiah / Oakland or Fresno / Sacto / Oakland thing instead like everyone else, but where's the fun in that? A typical Oakland summer morning -- grey, overcast, cold (about 16C), breezy -- i.e. perfect weather for an instrument cross-country. 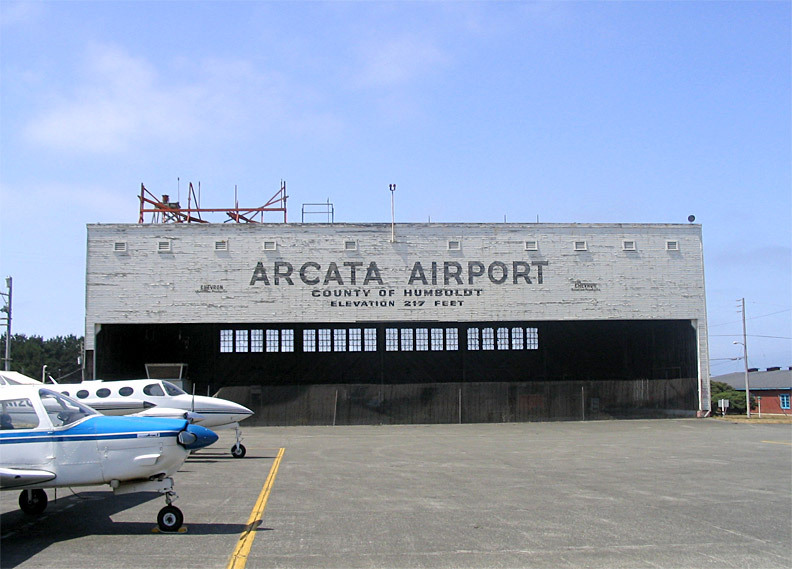 DUATS claims the ceilings at Arcata are varying between 500 and 700 feet this morning, so (as planned) we'll head straight for Arcata and check with Flight Watch before Ukiah as a sanity check. I call FSS and file an IFR flight plan -- V107 PYE V27 FOT, cruise 100 KTAS at 8000' -- and after engine startup and the instrument checks, I call Deliverance to get my clearance. Surprisingly enough, it's given pretty much as filed, the only (expected) exception being vectors on the initial segment to V107. John says I shouldn't be surprised, but I guess I expected more hoops to jump through -- something like "vectors to REBAS, SGD direct, STS direct, PYE ...", etc. Getting close to Fortuna VOR (FOT) I start prepping the ILS into Arcata, still unsure whether Seattle Center will vector me or whether I'll have to fly the full approach (no big deal either way, I'm just curious). About 25 nm out, Seattle actually calls and ask me which I'd prefer. I ask for vectors -- I want to do this the routine way -- and sure enough, a few minutes later we're gently vectored into the localiser with appropriate descents. Arcata's now reporting 800' ceilings, which is good for Arcata but not so good for experiencing more actual. Oh well. The ILS goes well, with a FedEx Caravan coming along behind us to keep us at a reasonable speed (John turns out to know the pilot), and we break out of the thin layer at about seven or eight hundred feet AGL with the runway close enough to sort-of dead ahead and land on 32 with a stiff quartering tailwind. Arcata's a nice shiny little college town in the middle of a large rather remote economically-depressed timber region on California's Redwood Coast (the college being Humboldt State University, haven to hippies and newagers everywhere), and the airport's kinda the same way -- slightly slow-moving, a weird mixture of clean efficiency and delapidation, friendliness and wariness. It's got no control tower (more on this later), but it's got a steady stream of Brasilias and Dash-8's doing the run to and from San Francisco, Sacramento, Redding, etc., and a similar stream of FedEx Caravans doing the freight runs, so the commercial side is really quite busy. The GA side, by comparison, is almost non-existent (GA seems to happen mostly at Murray Field, KEKA, just down the coast), and we have to share the fueling facilities and staff with the big boys. Luckily we arrive during a lull, and after a quick refueling we park outside the old airport building and wander off towards the new terminal building for lunch. By this time the sun's actually appearing; it's enough to cause one presumably-local pilot to later point at the sky and shout something like "Look! 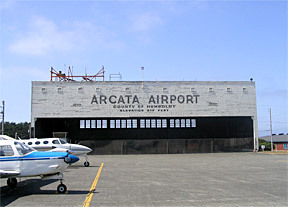 It's VFR at Arcata!" to us while walking past us on the apron. 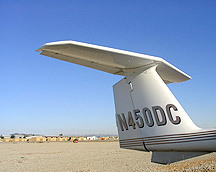 I use the phone to file IFR to Ukiah as planned, and we stroll out in the cold sunshine to the plane. John tells me that Arcata was in line to get a tower not so long ago, but it fell through. 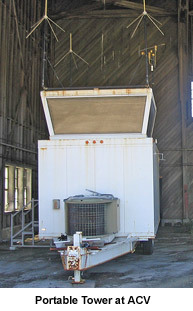 As we pass the old building he points out the tiny portable control tower that was supposed to be the initial tower. 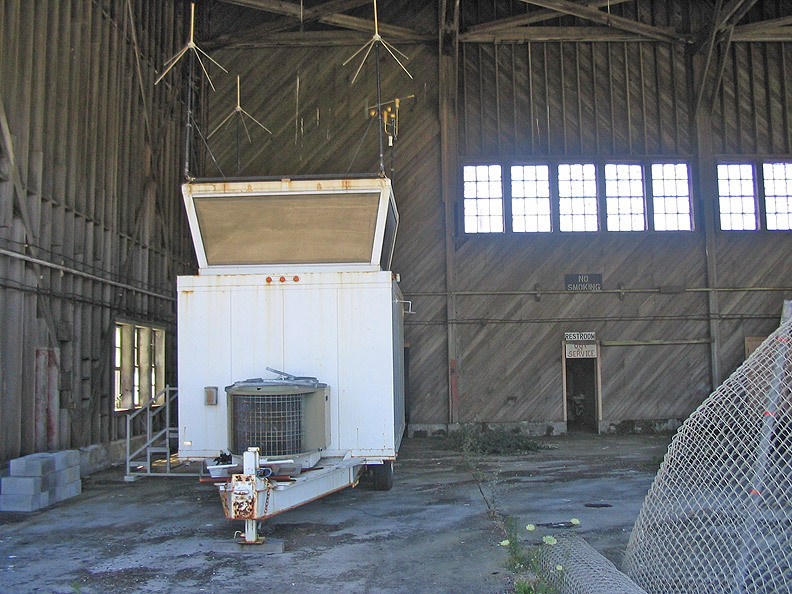 It's now sitting forlornly in the debris-strewn mess of the old building; it's not clear what the future of Arcata's tower is going to be (it's hard to see why a somnolent place like Salinas (KSNS), with no passenger traffic at all, gets a tower while Arcata doesn't). We taxi out to runway 20 and pick up the (as-filed) clearance from Seattle Center. He tells us we'll probably have to hold for release maybe five minutes for an incoming Brasilia, but as soon as he's finished giving us our clearance, the incoming Brasilia pilot tells Seattle he'll cancel IFR now (at 10 DME) if it helps get us off the ground earlier. So we get to depart immediately, thanks to the guy in the Brasilia (a nice gesture). The HOCUT2 departure takes you straight out over the (rough, cold, foggy) Pacific for at least six miles at low altitude, which is a little scary in a 172, but I'm under the Cone of Stupidity again and don't think too much about it. Like the rest of the flight to Ukiah, the departure is pretty routine, with just a tiny bit of actual on the way out. John starts getting bored and tries to find some music with the ADF. Not much to play with, but some cheesy Conjunto and rapid-fire Spanish DJ-ing from a couple of stations in the area livens things up for a while. Pity about the sound quality from the ADF.... Some distance out from Ukiah Oakland Center tells us to advise him when we have the airport in sight, presumably for the visual, but we tell him we'd like the localiser 15 approach (another little lesson in real-life radio work and procedures). No problem, and we start being vectored towards the localiser. You have to stay high for this approach until fairly close in, and even close-in you're only a mile or so off a bunch of hills that reach to within a thousand feet of the minimum altitude for that segment (I've approached Ukiah from the north VFR several times and know what's off my starboard wing...). Nothing much to report about the localiser approach itself except that from just before the FAF to short final things get intermittently rather bumpy, and I tend to wildly over-correct for the bumps while under the hood. We could also hear some CDF aircraft on the ground on CTAF preparing for takeoff on a firefighting mission, and with another Cessna in the pattern, I just trusted John to sort out whether we'd join the pattern VFR or do the straight in. In any case we cancel IFR at the last moment and land straight in between the traffic with the appropriate CTAF calls (one of my pet peeves at untowered airports has always been the oblivious IFR pilots who call in with positions in terms of IFR waypoints or fixes -- e.g. 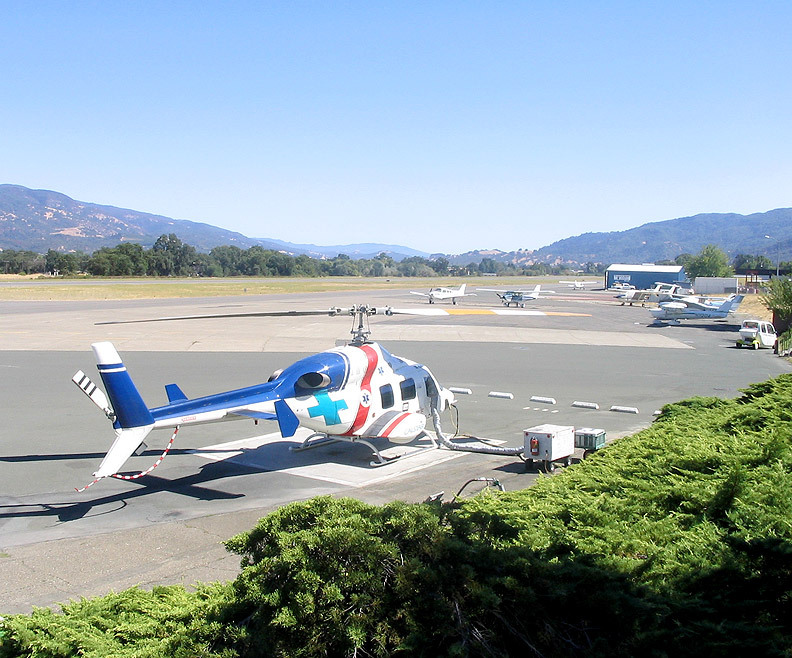 "Ukiah traffic, Citation 12R is at the outer marker on the localiser..." -- which the average VFR pilot may not recognise; I at least trying to learn to report in terms of direction and distance). Ukiah is hot -- the sort of place where you see everything distant through heat waves and mirages -- bone dry, and sleepy. A red-on-white CDF Bronco spotter and two S-2 tankers taxi past with that turboprop buzz and the smell of burning jet fuel. The Bronco's a plane I'd love to fly.... 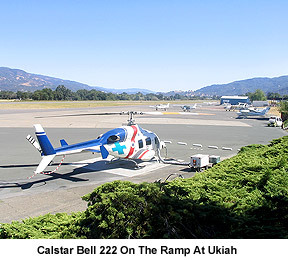 There's a Calstar medical helicopter hooked up for quick use just in front of the airport building. Inside the FBO, it's cool and dark. I file IFR to Oakland, and we return to the plane. John asks me how we're going to depart Ukiah. I've given it a bit of thought, and although there's a published obstacle DP for Ukiah, it takes us back many miles to the north, and crosses the pattern. It's currently very VFR, and there are firefighting planes in the vicinity heading for the pattern, and given the conditions and the fact that under Part 91 we don't have to do the published departure, I suggest we do the missed, which takes us to 4,000' on heading 140, then ENI direct. Neither departure is perfect, but at least this way we get clear of the pattern very quickly and safely. 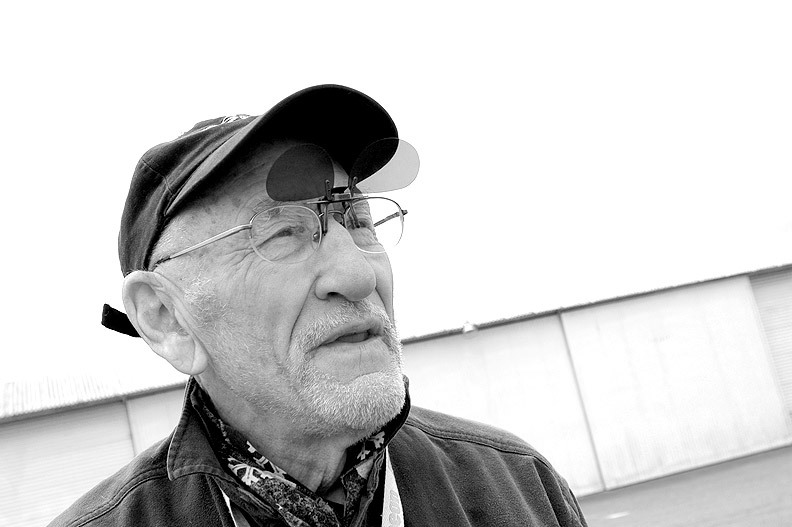 John agrees, but says that if it weren't perfect VFR, he'd do the obstacle DP. After startup we call Oakland FSS through the RCO, and promptly get told to call Oakland Center on 127.8. Hmmm, another useful lesson (in this case it's rarely clear which you should call; it wasn't clear that the RCO also does Center as well as FSS). Center gives us the clearance as filed, and off we go. The return to Oakland is also pretty routine -- as suspected, we don't get to fly any of the filed route back: Center just gives us a vector from above Mendocino straight for Oakland (about 90nm away at that point) and clears us Oakland direct when able. The GPS comes in handy here, since Oakland isn't really indicating reliably until about 50 nm out, but the controller's vector is pretty accurate in any case, and we just potter along at about 100 KIAS back towards Oakland on the suggested heading until the OBS needles stops swinging erratically. Over San Pablo Bay we start being vectored for the VOR/DME 27L approach, which ends up going OK, if (as always) my flying gets a little agricultural in the final moments. This is the sort of lesson I really enjoy -- a lot of real-world IFR flying, lots of little lessons in practical procedures, interesting destinations, and a nice variety of weather and approaches, etc. (plus some decent food and coffee). The main lessons were in planning and procedures, I think, and this time lots of things went right: for the most part I was ahead of the plane and the instruments, and my radio work was mostly acceptable (I made a few minor gaffes that didn't cause any real problems, like calling Oakland Center from Ukiah and claiming to be on the ground at Arcata, which probably caused some puzzled looks down in Fremont...). My altitude and airspeed control were better than last week, but still a little rough. The approaches were OK -- I went one dot below the glideslope at Arcata for a little while, which is cause for concern, but otherwise kept at or above all relevant altitudes, and I never went more than a couple of dots off the localisers or inbound courses horizontally. What went wrong? 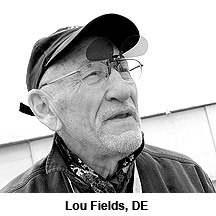 According to John, two main things: firstly, as mentioned, I didn't handle the turbulence on the approaches well (I seem to have forgotten the lesson I learned from Dave Penney during tailwheel training, i.e. just ride it out, don't try to correct for the sudden movements unless they turn into trends, etc.). Secondly, the Death Grip still returns during moments of confusion or stress, and also when I'm distracted by doing things like chart-folding, reprogramming the GPS, etc. It's getting better, but it's still definitely there at the wrong times. So what's next? Practice, practice, practice... more specifically, tightening the various procedures up to consistent PTS levels, which will takes some time (I sense a lot of On Top time in my future...), and polishing up for the orals. Also, now that 4JG is back on line, we need to do some real GPS approaches with the Garmin 530 (I've booked it for next week). A short lesson in IFR GPS usage with the Garmin GPS 530 in 4JG over San Pablo Bay: GPS terminal and enroute procedures, holds, the RNAV (GPS) RWY 6 approach with a circle-to-land on runway 18R at Napa (KAPC) and a shot at the missed, and the GPS RWY 27R approach back into Oakland for a change. As usual, nothing goes horribly wrong, but I'm not real pleased about my ability to cope with ad hoc holds (John got me to hold at REBAS using the GPS, with only a minute or so's notice, which I flew poorly) and other precision airwork. I've spent a few hours over the last week playing with Garmin's excellent GPS 530 simulator on my laptop, which was great preparation for the approaches themselves, so at least I'm mostly ahead of the plane and instruments for that part of the lesson. Pity about the flying, though. I've been a fan of GPS for flying, and for things like backpacking, sailing, cross-country skiing, cycling, etc., for years (I have at least 5 handheld GPS units somewhere around here), and this lesson helps reinforce a few prejudices. 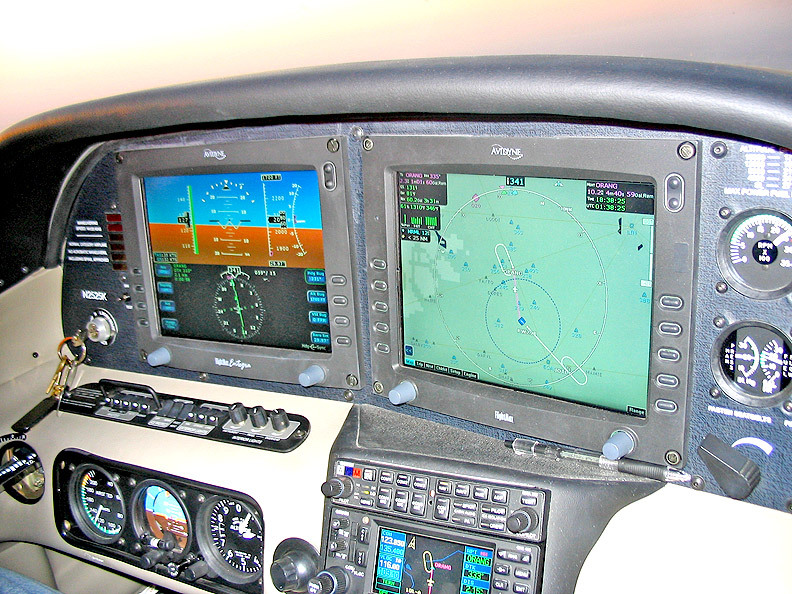 GPS as a concept, and GPS enroute and approach procedures and the associated instruments and displays (at least as experienced with the 530), just strike me as natural. 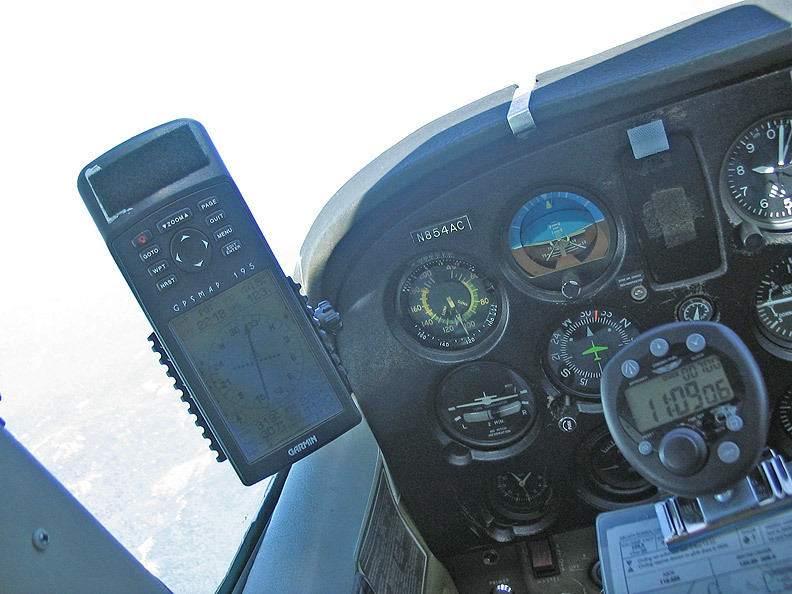 There's nothing conceptually or procedurally difficult about using GPS for IFR, and there are huge advantages -- the help with things like missed approach procedures or holds, the heading advice, the moving map for situational awareness, etc. 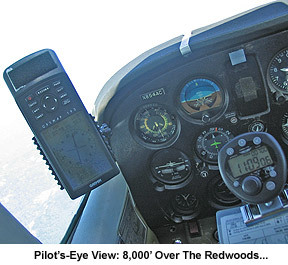 These things make IFR flying a lot less hit-or-miss, and a lot more forgiving (which some would probably say makes GPS a Bad Thing, but never mind). 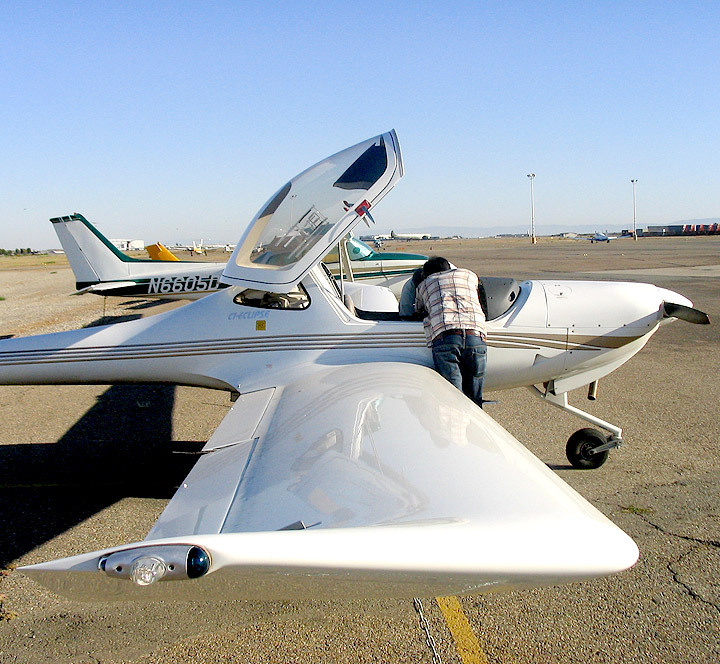 I think I'd agree with John: if you own a small GA plane and you fly it single-pilot in IMC, it's difficult to justify not having something like this (well, he puts it more forcefully). And the flip side of all this is that GPS approaches can be designed and specified for a whole bunch of smaller airports that wouldn't otherwise have any sort of approach. 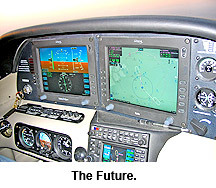 But overall, it's hard to imagine doing serious IFR work in the future without something like the 530. Just watching it sequence through the approach waypoints while telling me the upcoming desired track and when to turn (based on its groundspeed calculations), or the way you just hit OBS on the missed and it automatically points you to the next waypoint in the missed procedure, or having it tell you the hold entry procedure on the upcoming hold -- well, all that's just magic. When it's retrofitted with WAAS, the whole precision GPS approach thing suddenly starts looking real. 4JG's a 172 with a 180 HP engine (as opposed to the more typical 150 HP), and the difference makes for extreme climb performance and great sustained cruise speeds (for a 172, at least). 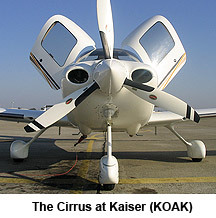 It also proves to be very stable in pitch, airspeed, and heading at slower speeds (below about 100KIAS), which is great in the approaches and when going missed. But I have trouble with heading and altitude stability much above that, and the entire leg home from the Napa missed approach hold to vectors for the Oakland approach I keep hunting around the heading in ways I don't seem to have to do in the other planes. I always seem to be a few degrees of heading, scalloping slowly along the course at 125 KIAS. Oh well -- I was never more than a dot or two out, but it would drive the average passenger crazy after a while, I suspect. Another short enjoyable evening's lesson in 4JG practicing GPS usage and airwork: steep turns, holds, unusual attitudes, GPS setup and programming, and the GPS RWY 27R approach into Oakland (twice), nearly all of it partial panel. This time everything feels good, and if my flying's a little agricultural, it's getting consistently closer to PTS standards, and I was ahead of the plane and instruments the entire time, for once. I'm still having problems with the Return Of The Death Grip and some tendencies to over-correct and over-control, but the approaches both went well, and the radio work's getting easier... Overall, things felt good. About 30 minutes into the flight, as we're departing the hold at SALAD intersection (which, surprisingly, isn't over Berkeley), John suddenly says "Look up and behind to your left!". Just Another Boring Bay Area Moonrise, the moon a slightly-flattened yellowy-orange disk coming up in the scattered cloud over the Diablo Range. Cool! Another short sharp lesson, again somewhat impromptu (John King, the club instructor who was going to do the phase check today called in sick this afternoon, so The Other John (John Ewing) offered to do a lesson on short notice instead): a filed IFR trip to Concord (CCR -- all of about 15nm away...), the LDA 19R and VOR 19R approaches there, then a quick double back to Oakland for the ILS 27R. No GPS, unfortunately -- this was 05D, with the old steam gauges. The shock? Basically, just how badly I coped with (of all things) the radios today. I kept losing it for some reason, missing calls to me, not doing readbacks correctly, saying the wrong thing, etc. Nothing lethal, but I thought I'd done better than that up till now. Most of the actual flying was OK, if -- as always, way too imprecise -- and the approaches went fine (with some minor allowances for a broken altitude here or there -- see below...). Not much to write home about one way or the other, this time at least. On the VOR approach into Concord, just as Travis Approach hands us off to the tower, and just at one of the highest-workload parts of the approach near the course dogleg, someone on the ground calls Concord Tower and proceeds to discuss a taxiway sign lighting problem at great length. I can't get a word in edgeways and start to think I'm going to scream -- we're barreling straight (well, as straight as I can fly) down the VOR final approach course next to the refinery towers at 100 KIAS and here's some guy on the ground making a set of confusing reports about signage on tower frequency. I do exactly what you're not supposed to do here -- I start obsessing about the damn radio and the landing clearance, and slowly lose altitude and heading control, and bust the minimum altitude for the leg on a course leading away from the final approach course. Urgh. A good lesson. When the guy on the ground finally shuts up, I call tower, who clears us to land just in time. When we return to refuel at Kaiser, there's a beautiful P-51 Mustang sitting in the dark on the apron in front of the Kaiser terminal. After refueling we wander over to take a closer look, and meet Tony -- an Australian friend of John's who works as a supervisor for Kaiser -- as we circle the Mustang. The Mustang's in great condition -- brightly-polished aluminium, well-maintained paint job, etc. -- and we spend a few minutes discussing this and some of the other military and ex-military planes you see around Oakland. Tony's had what sounds like a grim day of fueling bizjets and the associated baggage handling, and when he hears that I'm doing my instrument rating, he drily observes that for him the most useful part of his instrument training was being able to maintain spatial orientation while clambering around in total darkness inside the cramped baggage compartments of the average commuter or bizjet. I always knew these lessons must have some real-life relevance somewhere :-). Next to us on the ramp a smallish piston twin starts up without any warning, belching smoke and sounding like an outboard motor even after a short warm up. Not a pretty sound. And then the strobes go on, blinding us all; John mutters something about "bet he used to be a Bonanza pilot..." as we get out of the way. After a little less than 40 hours total instrument time (Cone of Stupidity, the Elite simulator, and actual), I now feel reasonably confident that I can cope with flying IFR in the system without becoming unstuck in IMC or anything like that, and that I could probably fly most conventional approaches fairly safely (if not with great accuracy yet). But I also feel reasonably sure that I need a fair bit more practice to get to full PTS standards for the checkride. I don't think I'm that far off under most circumstances, but the real problem seems to be the occasional reversion to bad behaviour under stress (the whole (Dis)Grace Under Pressure thing) and a few bad habits I sometimes forget to surpress. I still seem to fall prey to backsliding, when the Death Grip takes over, or I obsess about radio calls or altitude holding at the expense of the bigger picture. This is basically just practice, practice, practice, I guess. Plus actually listening to John when he keeps pointing all this out :-). And unfortunately for the Diary reader here, I just haven't had any real major stumbling blocks or intellectual crises yet -- no disorientation or major control problems under the hood or in actual, no problems understanding the different models underlying each approach type, few real problems with things like estimating vertical speed on the fly or intercept headings, etc. No bizarre halucinations while surrounded on all sides by fluffy white clouds. Etc. That is, nothing that would spice up the diary a bit :-). Sorry about that. Maybe things will improve when we get to the checkride, which looms large on my own personal Fear Factor scale. I'm sitting there thinking "there's something horribly wrong here...". Travis Approach has given us a vector onto the Concord LDA 19R approach and cleared us for the approach, but we're nearly abeam the CCR VOR just outside the outer marker and the course needle's still not alive after several minutes on the same heading. Just as I start wondering what I should do, Concord tower calls me, tells me we're way off course, and asks what are my intentions? I look at Ben, who's sitting there poker-faced in the right seat playing DE for the phase check. No help there. Eventually -- with a bit of stage whispering from Ben -- I stumble back on air to tower and say we'll go missed as published. Tower responds with an irritated "05D, there is no published miss for this approach". This time even Ben looks confused. We're both looking at the approach plate and we can both see the published miss -- head for CCR VOR and hold. I'm completely at a loss on what to do, and ask Ben to take over the radio. Yes, I'm failing miserably here. I've just "failed" the stage check (well, you can't really fail a stage check, but that's how it feels). Ben tells Tower we'll return to Travis approach, head to the VOR, and hold; tower responds with a terse "approved", then tells us he had no idea we were on an IFR flight plan, or that we intended going missed after the actual approach (if I hadn't screwed it up completely), or what our intentions had been. But we've just been handed off to Tower from Travis approach and we've told Travis our intentions at least once. Something's missing, here, and it's not just me. And it only gets worse from here. The next approach -- the CCR VOR 19R with the dogleg after a couple of turns around the hold at CCR VOR -- goes awry at the dogleg, and an approach I've successfully flown many times both in the air and on my sim goes belly-up. After being unable to track the inbound 171 degree final course after the dogleg (or even find it properly) I tell Ben I'd go missed in real life right here, and Ben has me look up and do the landing visually. I've completely failed. Nothing gets much better for the rest of the flight -- yes, I do the DME arc, the airwork, the partial panel work, the ILS 27R into Oakland, and a bunch of other stuff OK (if very agriculturally), but if this had been real life I'd have been in real trouble, and if this had been the checkride I'd have failed early on the LDA approach. So what went wrong? The usual cascade of small events.... It started well -- the climb out of Oakland and the initial vectoring for the LDA approach all went fine (with the usual missing details here and there). But during the vectoring, I forgot to check the heading indicator against the compass, and by the final vector I was nearly 20 degrees out. A very basic error. Combined with the fact that (according to Ben) the vector the controller gave me was pretty marginal anyway given the wind, I was simply never going to intercept the course, and it's no surprise the needle never came alive. But I should have caught all this earlier instead of just sitting there waiting for the needle to start moving -- I failed dismally on some absolute basics here. Ben would have been quite happy if I'd just declared I was going missed and done so, then sorted it all out in the hold. But no, I just sat there. And then the radio problem with Concord -- no, not my fault that the handoff was apparently botched and that the tower controller didn't seem to know the approach that well, but I handled it really badly. I should have been able to keep my wits about me and do exactly what Ben did -- come up with a course of action that amounted to the published miss and tell Tower that that was what we would do. And I never really recovered for the rest of the flight. I should have been able to put all that behind me and start again at the hold (which would also have satisfied Ben -- I can botch one approach on this stage check without causing him much concern, especially since I'd recognised fairly early that something was wrong), but I kept obsessing about the earlier mistakes instead of thinking ahead. So the VOR approach goes badly, and then everything else gets off on the wrong footing as well, and I end up making simple errors even in things like the DME arc, which I should now be able to do in my sleep. If nothing else, I think I can now guarantee that for the rest of my flying life I'll check the heading indicator against the compass every few minutes, and over every damn IAF, FAF, and significant point in any approach or departure. So what did I do right? According to Ben, he was happy with my overall altitude, heading, and airspeed control skills (I busted altitude a couple of times, but noticed it and corrected well); he thought I had good positional awareness on the approaches (I'd mentioned the early vectors didn't make much sense, and I'd noted out loud that the controller had forgotten to let us down in time for the VOR approach, meaning I had a couple of miles of over 1,000 fpm descent to do on the dogleg, increasing my workload); he thought my radio work was generally good, with the obvious exception of the Concord Tower Thing; the hold at CCR VOR went well, with only a few seconds to set it up; I flew the ILS back into Oakland OK, if roughly; and the general airwork -- stalls, steep turns, slow flight, bad attitudes, etc. -- was good (but then that's something Ben's being teaching me for a long time, hood or no, and I couldn't help treating it like basic IFR aerobatics with him :-)). A humbling, mortifying experience. A really really good lesson.... (and thanks to Ben for being so good at emphasising the positives after what for me was a draining, depressing flight that made me question whether I really had it in me to be an instrument pilot). I don't know quite why I made such a mess of things, especially since every damn one of the things I did wrong was something that John had patiently worked on for a long while. I guess the meta-lesson is to pay more attention to the lessons :-). 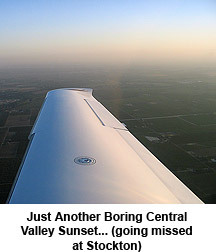 A leisurely evening's lesson with John out over the hills on a filed flight plan to Stockton (KSCK) in 05D, a couple of times around the ILS 29R there, then over to Tracy (KTCY) for the VOR-A with the missed, then back to Oakland for the ILS 27R. A bit of holding and airwork, a bit of actual, a bit of partial panel, and a lot of fun. This time, everything seems to come together just fine, and apart from some sloppy flying here and there, I fly well, ahead of the plane and instruments pretty much the entire time. I even get the hold at TRACY intersection on the missed after the VOR-A approach right this time; unlike the first time, instead of obsessing about intersecting the SAC-157 radial (which didn't come unflagged, let alone alive, until too late), I just concentrated on getting to TRACY By Any Means Necessary -- DME, the ECA-229 radial, and a bit of pig-headed determination. John talked to Ben today and they both think I'm making way too much of Tuesday's stage check problems -- Ben was overall fairly OK with my, erm, work, and told John I'd actually been dealt a pretty bad hand by ATC both times at Concord, and that while I could have coped better with that, without it things were reasonable. (Ben told John he'd watched amazed as -- while I made a bunch of wild twists on the OBS during the DME arc and seemed to be winging it and making it up as I went along -- I just kept determinedly steering the plane around the DME arc mostly well within the half mile tolerance and keeping within a few feet of assigned altitude, almost in spite of the damn OBS or any other damn instrument Ben suspected I was using). A cold night immediately after a cold front's blown through the Bay Area, a forecast of scattered cumulonimbus, rain, and thunderstorms on our filed route to Stockton... but all around Oakland and the Bay it's actually clear or clearing, with bright moonlight lighting up the remaining few clouds and no ripples on the puddles around the planes at the Old T's. But it hasn't cleared over Stockton and the Central Valley, where icing levels are near the MEA, and we make the obvious decision not to chance it, and settle for a quick flight out over San Pablo Bay, the VOR/DME 29 approach into Petaluma (partial panel, with hold), then the ILS back in to Oaktown, all in 05D with the steam gauges (4JG is undergoing a 100 hour inspection). On the approach back in to Oakland we're vectored towards the localiser just outside FITKI (the FAF, where the glode slope intersection is supposed to happen at 1,500') at the usual "best forward speed" and at an assigned altitude of 3,000'. At the last second the NorCal controller lets us down to 2,500' until established -- only a mile or two from FITKI when we're not yet established. I'm fit to scream -- we've got a maximum of two miles to descend 1,500' through the glideslope at 110 knots, join the localiser, intercept the glide slope from below, and stabilise the approach (all with the likelyhood of some corporate Gulfstream bearing down on us further up the ILS at high speed from SUNOL) -- but I decide to see what happens and how this plays out, since it's the sort of thing you need to be able to handle one way or another on approaches to major airports. Nothing bad happens -- I make it, just -- but the tempation to grumpily query the controller or go missed at this point gets very strong.... John (as usual) has a few pithy things to say about the way the NorCal guys are making this a regular thing nowadays, and discusses a few strategies for coping.